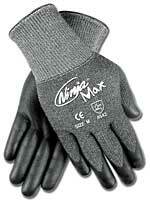 MCR Safety's Professional Grade Ninja series gloves feature unique shell and polymer combination technology. Similar to sport and fashion gloves, the Ninja X, Ninja Flex, and Ninja Max are user friendly and offer an assortment of dexterity and sense of touch. They come in sizes small through extra large, are Proprietary Silicone free Bi-Polymer coated, and treated with Actifresh® to kill bacteria.